I realise that for most of the northern hemisphere, it’s still summer. But not here. The sunshine in Ireland has faded quicker than Richie Porte at a grand tour, and by the looks of things it won’t be too long until I’m digging out the winter kit bag. A little wind, a little drizzle, the occasional ray of sun – that’s the Irish summer. 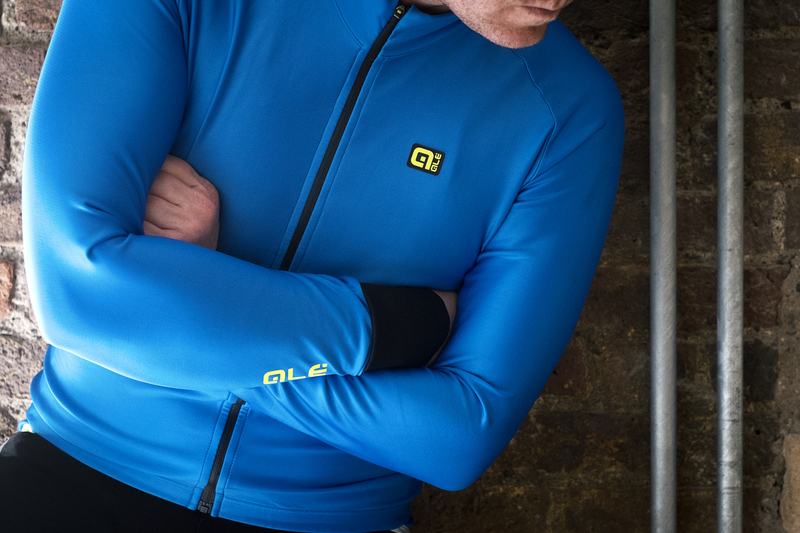 There have been a few rides recently where the changeable elements called for something more than a jersey. And as luck would have it, I had Alé’s K-Tornado jacket waiting to be tested. They say jacket, I say long-sleeve jersey. Alé suggests a temperature range of 6º to 12º Celsius (that’s 43º to 54º in old money). But depending on how you layer I’d say it functions well outside of that range. I’ve been using it with a base layer and short bibs to great effect in a variety of conditions. It does a great job of keeping you warm and dry without the old boil-in-the-bag feel that used to come with a lot of wet-weather options. Can anything really be waterproof and breathable? Ignoring the marketing jargon, common sense would say no. But having said that, this jacket makes for a pretty good compromise. Alé says that their proprietary waterproof fabric features “billions of microscopic pores that allow sweat to quickly evaporate.” Sooner or later, the rain will get in, but I’ve tried running a tap over the sleeve and the water beads right off. At the same time, it’s a world away from a plastic rain cape in terms of general comfort, and I’m happy to pull it on even when it’s clear outside. The zipper is waterproof and the stretchy material will keep out everything but very heavy rain. The long cuffs cover more on top without bunching up below your palms, thanks to an asymmetric cut. That leaves you both covered and comfortable, and while this next observation has nothing to do with functionality, I also think they look cool. A flap covers the pockets to help keep them dry, and the bottom of the jacket extends nice and low so you can cover your behind from tyre spray. There are also some nice reflective strips for added visibility. Alé have been around for a long time, often making product for other brands. You’ll come across plenty of their stuff in Italy, but they’re no so well known internationally. They should be. Both the materials and the finish feels top-notch, and the cut will appeal to anyone who like a racy fit. Definitely worth considering when the weather eventually turns on you.